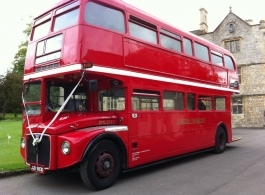 A choice of two London Routemaster Buses for wedding and event hire. The classic Red London Bus is an iconic mode of transport in the UK and we are pleased to offer these two superb Buses for wedding and event hire. The Routemaster Bus is great for weddings as so many of your family members and wedding guests can all be transported to and from the wedding venue together, the Bridesmaids will often travel on the wedding Bus and even the Bride and Groom sometimes. Please note that personalised destination blinds are available for an additional cost.